80301 is an example of the type of Travelling Post Office carriage which replaced 70294E. Built at Wolverton in 1959 it was the second of the then new Mk1 design sorting vehicles. It was fitted with full mail exchange equipment and differs from later batches of sorting carriages in having larger windows (the design was changed after the train robbery in 1963). The use of the exchange equipment ceased in 1971 and the equipment was removed. 80301 continued in service (repainted blue/grey and then bright red) until 1995, when the earlier sorters were withdrawn. Preserved by an RVP member in 1998, it arrived on the GCR and was made serviceable in 1999. In 2002 it received a repaint in its original livery and re-entered service. 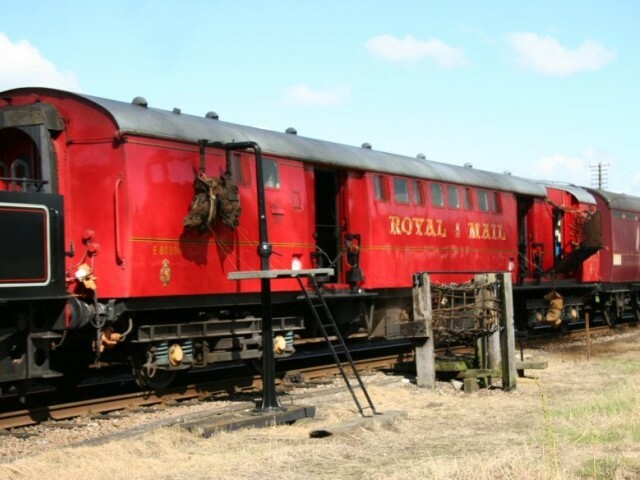 At special events it is often used in the centre of GCR passenger trains enabling visitors to try sorting mail on the move. It has also seen use with the LNER TPO set and on photographic charters. In 2006 it was fitted with working traductor arms - first used in July 2006. The project continued with a new catching net fitted in July 2007. It is now fully operational although further internal work is ongoing to conclude its restoration. During 2010 RVP purchased the vehicle from its previous owners.